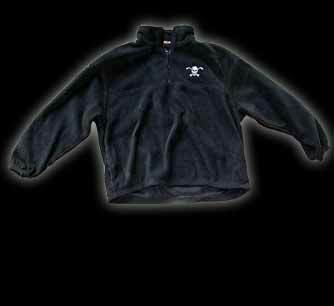 If there's no room in the BMWer after the game, than you'll definitely be needing a thick, warm Pirate Fleece. This high-quality black fleece features the Coastal Pirate logo embroidered on the front and Coastal Pirates Hockey stitched in an arc on the right sleeve. A one-third front zipper allows you some breathing room, and two hidden pockets leave room for you to keep a pen and paper to jot down some hot stock tips from Roger. So don't be left out in the cold, get your fleece today.